In Cameroon, it is not uncommon to see a criminal striped naked - mercilessly pounded with sticks, stones, metals, et cetera - bleeding profusely and set ablaze by an angry crowd. This is "jungle justice." "Jungle law" applies to criminals of all ranks - from pick pockets to armed robbers and murderers. Many "criminals" have even been killed for attempted thievery. 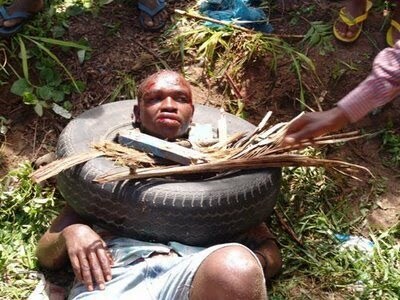 Civil offenders also face jungle justice in Cameroon. 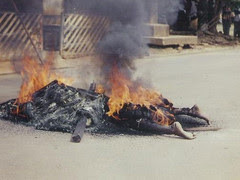 I vividly remember the case of an exiled traditional ruler - Vugah Simon II of Kedjom Keku, a village in the North West Province, who was beaten to death and set ablaze. What was his crime? He was accused of selling village farmlands and destroying the tradition of the village he once ruled. In Cameroon, it is common to see jungle law applied in the presence of police officers - many of whom are either in favor of the practice or are powerless in the face of an angry crowd. In many instances, jungle justice is served to "suspects" - long before the police arrive on the crime scene. There have been shocking instances where criminals in police or gendarme custody have been seized by an angry crowd and beaten to death. What law sanctioned the above case? Who was the judge? Who was the defence counsel? Is Cameroon a lawless state where angry citizens take the law into their own hands and sentence criminals to death on the streets? Proponents of jungle justice have attempted to justify this inhumane practice. Many argue that the police force is corrupt and criminals bribe their way out. No doubt, it is true that the police force is corrupt but does this justify carnage and barbarism? The government of Cameroon has failed - and continues to fail - in its [legal] obligation to protect victims of jungle justice. The Preamble of the Constitution of the Republic states that all accused persons are entitled to the rights of defence and are innocent until proven guilty in a court of law. It also provides that every person has the right to humane treatment under all circumstances. It is worth mentioning that the Universal Declaration of Human Rights and the African Charter on Human and Peoples Rights are incorporated into the Constitution. Cameroon is party to the International Covenant on Civil and Political Rights (ICCPR) and other international conventions that prohibit torture, cruel or degrading treatment and uphold the right to life. Article 6(1) of the ICCPR guarantees every individual's "inherent right to life". This article stipulates that no one shall be arbitrarily deprived of life and that the right to life shall be protected by law. Article 7 provides that no one shall be subjected to cruel, inhuman, degrading treatment or punishment. The state must fulfill its obligation under international and national law to protect and promote civil and constitutional rights of all individuals. To achieve this, the state should move quickly to put an end to such abysmal violation of rights. Citizens of Cameroon seem to be unaware of the fact that they, as citizens of a democratic state, have a constitutional duty to respect the rights of other people. It is not uncommon to hear citizens complain about violation of their rights. What about the rights of others? Many people mistakenly think that criminals do not have rights. The truth is all natural persons have rights by virtue of being human and every individual has a duty to respect the rights of others. Jungle justice is unlawful, inhumane and a violation of constitutional and fundamental rights of countless victims. The government of Cameroon should end impunity and hold perpetrators of jungle justice accountable. Just a quick one. Such is mob justice and not jungle justice. Jungle justice is the survival of the fittest. Thanks for weighing in, Ameh. I maintain - jungle justice is what happens when people take the law into their own hands. Hence, mob justice is jungle justice. I'm afraid justice has little or nothing to do with survival. Back to the subject matter - is jungle or mob justice justifiable? I will like to know where you stand. am currently doing my research on this topic at my masters here in england.if i could get some more videos like this then it will be good for cameroon tomorow.